This collection of eclectic, original solo pieces features a variety of styles from some of FJH's leading composers. 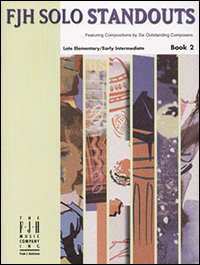 FJH Solo Standouts, Book 1 is an excellent accompaniment to any piano method, allowing students to reinforce lesson materials while learning to play new styles. 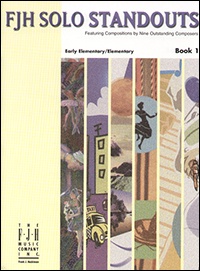 This collection for the late elementary to early intermediate levels features some of the most popular solo piano selections by leading FJH composers. This book serves as a perfect supplement to any method, and provides a simple way to have fun, educational, and appropriately leveled solos right at your fingertips! Perfect for recitals, lessons or just for fun. 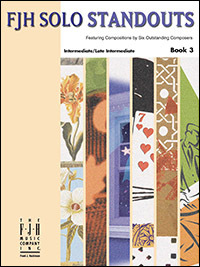 This book features some of the most popular and best-selling solo piano selections by leading FJH composers for the intermediate/late intermediate level. Pieces by Kevin Olson, Timothy Brown, Martín Cuéllar, and more, provide perfect supplemental material right at your fingertips for lessons, recitals, or just for fun!